Monopoly (Edition 3D) does an extraordinarily good job of depicting Monopoly, the original classic, but instead of just locking you onto a top down board, it gives you a lot more possible angles to see the board. It's a bit gimmicky, graphically, because after all, you can play the game from a top down perspective without issues just as well. But, with a well produced bottom of the screen interface, that makes it easy to know how much money you have and what you own and what you are renting, each move does a good job of it all. So, ultimately, Monopoly (Edition 3D) is a great game, well done, beautifully rendered, and it is the kind of production that will definitely keep you interested all of the time. 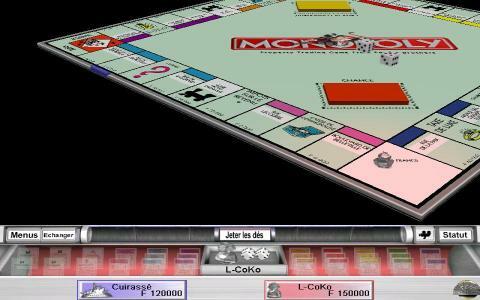 More so, what you will find interesting in Monopoly (Edition 3D) is the fact that it looks exactly like the classic monopoly counterpart, which is great for immersion and that feeling of playing the real thing. 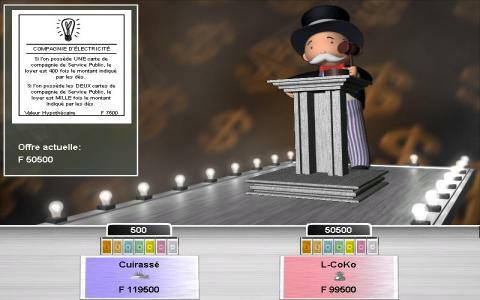 Another good Monopoly digitization is also Monopoly (Adam Stevens, 1998) but with this one all excesses are out. This is a bare metal version, as it even plays via text based inputs. So here you have it â€“ the entire range, from ultra high quality graphics, to text based inputs! The choice is yours!